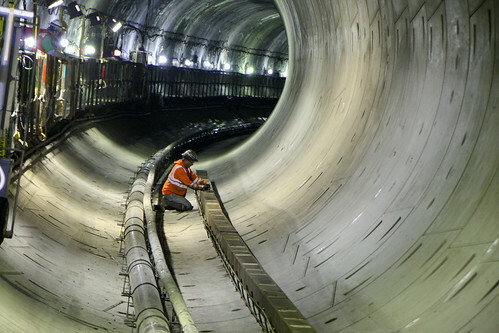 University Link tunnel construction, originally uploaded by SoundTransit. With concern about vibrations and noise peaking at the surface along Broadway as the first of two tunnel boring machines traveling from Montlake prepares to bust through a concrete wall and end its two-mile, 10-month journey Tuesday, Sound Transit says it is studying a much larger concern — worries that the vibrations felt by residents and businesses created by track-use during construction will continue when the U-Link light rail line becomes operational in 2016. What’s happening now is less of a concern for the agency — though any damage proven to be caused by the vibrations could be costly. The noise and vibrations now felt around the end-target for the “holethrough” expected later today are the same that shook a much quieter part of Seattle — we first reported about the Montlake Murmur late last year. Described as everything from the deepest bass you’ve ever heard to sounds of raspy, rhythmic scraping, the sounds and vibrations have followed the line up from Montlake, under Volunteer Park and up to Broadway. We reported on families near Volunteer Park affected by the issue in January as the worst of the rumbling seemed to have moved through that area. Hi – was at a neighborhood meeting yesterday that was attended by the neighborhood liason from Sound Transit. – Roger Pence. 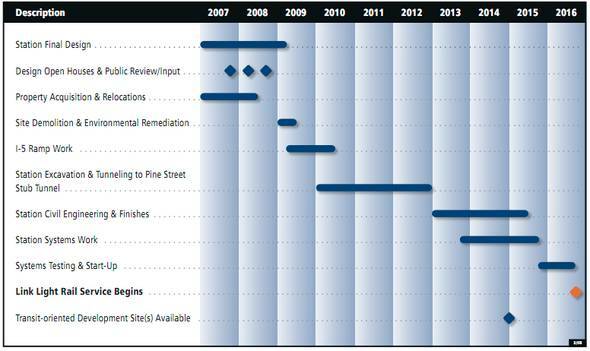 As you may be aware, the Sound Transit tunnel project under Montlake caused that neighborhood many headaches due to noise from the tunneling and supply trains running. Neighbors on Capitol Hill have been complaining too. Some residents are hearing the trains running at all hours. It’s a low rumbling noise – I’ve heard it myself. The house has also vibrated at times. Two nights ago I felt my bed shaking a bit. In any case, we, as a neighborhood, are very concerned as to whether Sound Transit will spend the money to mitigate the noise. Unless people directly complain to Sound Transit, they will not be motivated to spend the money. I myself, was guilty of only talking to my neighbors, not letting Sound Transit know that I was concerned until I attended this meeting yesterday. Personally, I’m concerned that when construction is finished, I will continue to hear the noise of the trains running, and that, in turn, will diminish my property values. It would be great if you did a blog post and see if it is being heard, felt or disturbing other people on Capitol Hill. The final arrival on Broadway of the two machines from Montlake — one expected today, the other in about 4 weeks — won’t end the tunneling work. 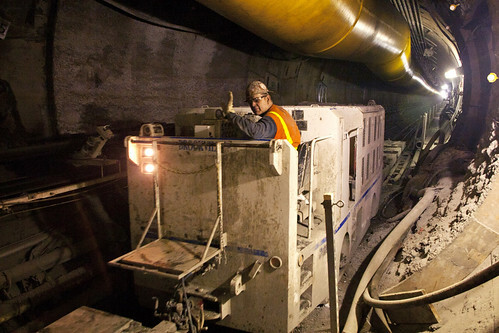 “[W]ork continues for several months after the machines arrive at their destinations, because of the need to build “cross-passages” that connect the southbound tunnel to the northbound tunnel, and install concrete floors, emergency walkways, and utility conduits,” Sound Transit said in a recent bulletin. 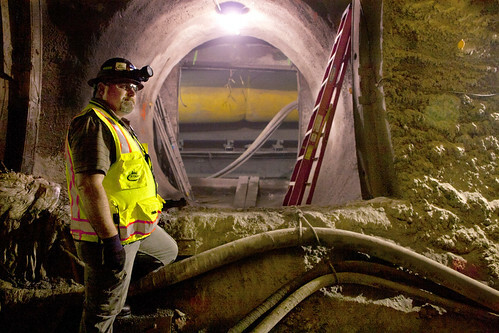 Meanwhile, possibly due to the types of buildings and structures its moving beneath, the trips made by the third tunnel boring machine working the 7/10ths of a mile between Broadway and downtown have been relatively silent. Nice job, Brenda. For as much of an irritation the line has occasionally been at the surface, the project has also been an on-time, on-budget engineering marvel. We’ve included on this post some pictures of the work crews building the tunnels recently provided by Sound Transit and wrote about the nitty gritty of the engineering in this post last year. Still, for all the engineering, there are also human elements at the surface as well as the economic and development impact of the project including this recent piece by the Tacoma News Tribune about what the end of tunneling will mean for the plant that produces the concrete tunnel segments. A low rumbling? Planes that pass over my house on Capitol Hill make more noise than that. Seattle always begs for mass public transportation solutions, but no one wants to be impacted with the visual or noise cost of such projects. It’s really easy to bluster on about NIMBYs when it’s not your bed that is shaking you awake in the middle of the night. Most affected neighbors want this project to be successful, but they have to speak up to let Sound Transit know there’s a problem. If they do, ST has a chance to fix it. In Montlake, we spoke up, and Sound Transit installed rubber pads under the supply train tracks. Problem fixed. Sound Transit agreed to design the future tunnel under the UW campus to a higher noise and vibration standard than in the neighborhoods. Now that residents all along the line are reporting noise and vibration issues, Sound Transit should design the permanent track to the same high standard as UW. People living and sleeping in their homes deserve the same high standard as university professors and students. It would be nice if sound transit reimbursed them. I totally agree with you. We need this and it’s worth a little rumble. If it is that bad and can’t be remedied, it would be nice if they made up for loss of property value or even if it’s real bad, buy a few pieces of property. I do understand the peoples complaint though…Especially the ones who bought their houses 20 years ago because “It’s a quiet neighborhood”. Us on Capitol hill, yeah, what difference does it make…The delivery trucks and garbage trucks create more of a rattle, hum, vibration or a deep bass than what I have heard so far from the drilling machine. But it sounds like I will know for sure today exactly how much I will be effected. For those living above or near the line – please understand the difference between the boring machine noises and the supply train noises. 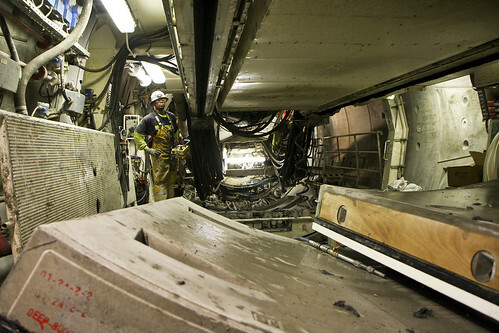 The boring machine makes noises and shakes the ground as it grinds up rock. But it passes and is gone in a couple of days. Then the supply trains start running… and running… and running. The noise they make is more concerning because it is not unlike the coming passenger trains. The passenger train track can be designed to mitigate noise and vibration, if they do it right from the start. Shame on you for suggesting that the people who live in this city should put up with mediocre engineering solutions in this day and age! The electric buses are quiet. The new garbage trucks are quiet. The streetcars are quiet. Practically no one honks their car horns. We even passed a simple ordinance that has been effective in getting drunks to quit shouting after the bars close. I’ve lived in other cities, in the country and in the burbs. Now I’m in a Capitol Hill apartment with double-paned windows and even though I’m in spitting distance of half a dozen bars, this is the quietest place I’ve ever lived, by far. I am located immediately across from Lowell School. The rumbling noise and moderate vibration of the house happens more-or-less every 15 minutes. Yes, we have the airplanes, too, but they stop overnight. I haven’t had an uninterrupted sleep for 3 weeks now. I feel like a zombie – either because of the lack of sleep, or because of the sleeping pills I have to take. Ahh Cecilia, perhaps what you might not know is that a good majority of the houses that are affected are quite different than the ones on Beacon Hill. This area was built mostly prior to the 1906 earthquake in San Francisco. What they discovered in 1906, is that reinforced concrete buildings were relatively unscathed in the quake, and brick buildings were heavily damaged/destroyed. What does this mean and why should it be a concern? Well, most of the neighborhood, us NIMBYs as you say, have houses that are built prior to 1906, and have brick foundations. Constant low rumblings in the earth tend to settle things, and there’s a good chance all this rumbling could lead to foundation damage. Beacon Hill has for the most part concrete construction, we aren’t so lucky. If there is damage due to negligence, omission, or poor engineering you can bet there are going to be bills to pay. I’m 600′ away from the tunnel and I hear the rumblings of the train every 15 min or so, I understand it might be temporary, but it’s still low level vibration, and it’s still something that can damage my house. Am I concerned? Probably not nearly as much as those closer to the tunnel. But dismissing us as NIMBYs is a bit childish, when there really is a concern due to the age of our neighborhood and the possible repair cost. I live on the intersection of 10th Ave E and E Thomas St, and my house is probably about 100′ from the tunnel. I have neither heard or felt anything in the past week as the machine has done its thing very close to where I live. I have to wonder about the reports of others further north…why would they have problems and I would not? Do you have a basement? What type of building are you in? I hear that supply train all the time and I’m by no means a sensitive hearing type,I sleep like a rock, so it doesn’t bother me at night. It is there though, and while it’s not particularly annoying to me, I emphasize with those who it does bother, because I can see how annoying it could be. I also sleep on a 2nd floor, if I was sleeping in my basement or ground floor, it would be louder and more annoying. I’m already bored by this story. You’re just digging a hole for yourself.